A report by the Passenger Shipping Association (PSA) has shown a record increase in the number of cruise holidays last year. The study highlighted a rise in the popularity of family cruises and other voyages at sea, despite the gloomy economic climate. In 2010, British travellers embarked on some 1.62 million cruises, up six per cent when compared with the 2009 figure. People took cruises from Southampton and other domestic ports. An improvement in the cruise sector may also have boosted travel insurance sales. The report also showed a 10% increase in the number of voyages from Britain, with over 650,000 people venturing out of the country during the year. According to the study, the Mediterranean was the most popular cruise holiday destination among Britons in 2010. 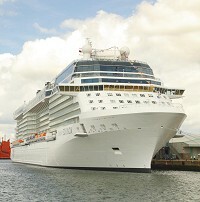 PSA director William Gibbons said: "The UK cruise market continues to buck the trend and 2010 was no exception. "The cruise sector continues to report impressive growth and the success of UK cruising, during one of the toughest economic periods the world has seen, can be attributed to the excellent value for money and the fantastic variety of a cruise holiday."